Most businesses set prices by focusing internally on their costs and adding what they believe to be an appropriate margin. The attractions of this method are obvious. It is easy to set prices this way, as all it takes is a few keystrokes to arrive at your price. The problem is that setting prices in this way leaves money on the table, sometimes huge sums of money. That is because a price based upon cost bears no relationship to what a customer is actually prepared to pay. As customers, we are blissfully unaware most of the time of the cost of a product or service. Instead, we simply choose between the alternatives the one that we believe offers the most value. Without doubt, there are potential customers of your business right now that would be prepared to pay more if it was necessary. I believe that the key to claiming some of the money that we are leaving on the table is to set value based prices. There are two primary approaches to setting value-based prices. A one-to-one price is used when negotiating a price to sell one unit of a product or service to a single customer. A multicustomer price is used when setting a unit price to sell many units of a product or service to more than one customer. I'll offer a brief overview of how we might set a value based price in each instance. Let's use the example of renting out commercial units to illustrate how this might work. Suppose you own a commercial unit that you rent out on a monthly basis. A unit across the street is also available for rent. They are a comparable size with identical features, with the exception that yours has extensive space out front for parking. They were built at the same time by the same company to the same design, so the only thing that differentiates one from the other is the parking. Now, a business owner looking for premises is deciding which of the two commercial units to use. So, what is the highest rent at which you will be able to do a deal? There are five steps in determining what this might be. 1. Identify Target Customers - Local small business owners that require a commercial unit. 2. Identify the Next Best Alternative - The commercial unit across the road. Use this price as the starting point. 3. Determine Your Products Difference - In this case, your unit has extensice parking. 4. Calculate Your Products Value Based on this Difference - Suppose from your experienced judgement, you've determined that certain business owners will pay a 15% premium over their next best alternative for this outside parking space. 5. Do a Reality Check - Before basing your price on the customers next best alternative, you have to do two things. First you need to determine that their price is realistic. If the price of the next best alternative is too high, it's not a valid starting point. Second, you'll need to know if you can actually make money at that price. Renting a unit out at £1000 per month will probably not make you very happy if the mortgage payments are £1200. Imagine that one landlord in a hurry to rent out his comparable unit has put his up for £1000 per month. Unfortunately, as this represents a viable option for customers, the base price has to reflect this low price. However, due to the income effect, if customers are geting a good deal on the unit, they may be more generous in what they will pay for premium attributes, such as extensive parking, so the appropriate price would be £1250 (£1000 + 25%). Admittedly, there are only a limited number of one to one pricing situations, such as selling or renting property, selling or leasing a car or setting a custom price for one customer. However, this methodology illustrates the fundamental points of pricing that are relevant to every pricing situation. In the example above, the objective was to rent a quantity of one commercial unit to one customer. Most businesses however sell more than one unit of their product to a variety of customers. In this situation, value based pricing means striking the optimum balance between price and quantity sold. To do this, we need to start as we did in the previous example by identifying target customers and their next best alternative and undertand your products differentiating characteristics. What is new is the need to incorporate the concept of different customer valuations for these unique characteristics. Let's use the example of a laptop computer sold by two different electrical retailers that is identical in every respect apart from the warranty. One offers a one year manufacturers warranty whilst the other offers a three year next day repair warranty. The better warranty offers an opportunity for one of the retailers to charge a higher price than it's rival. The question is, how much more? Some purchasers will value the better warranty more than others, whilst some will not be interested in a warranty at all. We can use this information to create a demand curve that reflects the fact that some people will be prepared to pay £100 extra for this enhanced warranty, whilst more will be prepared to pay £50 extra and many might be prepared to pay £25 extra. This is what they call in economics price elasticity of demand. The curve is created using market research or experienced judgement. It can also be done using some basic price testing across different sales channels. Once we have a demand curve, the next task is to determine the right price. This is done by simply asking, "how much profit can be made at key price levels. If at a price of £500, the retailer would sell 100 computers with an enhanced warranty at a profit of £200 per unit, this would yield £20,000 gross profit for that product line. At £450, profit would reduce to £150 per unit but if we knew that in so doing we could sell 150 units of the laptop, then the gross profit for that line would £22,500. Compare this with the 175 that might buy at £425 per unit, yielding a gross profit of "£21875 and we see that the optimum price of the three key price levels would be £450. 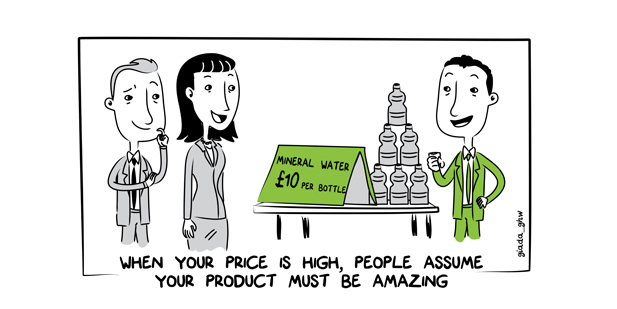 Obviously, this is not an exact science but in my experience this approach to pricing can really help. Many would assume in the previous example that higher the margin that they could justify, the better for the company but the highest margin price that a reasonable number of people might pay is actually the least profitable. There was at least an extra 10% gross profit to be made by stocking the laptop with enhanced warranty at a lower price than many people were prepared to pay. Of course depending on the shape of the demand curve or the elasticity of price elasticity of demand for that particular product, a higher or lower price may have been the optimal one. The final consideration when it comes to value based pricing is that a product or services value will change over time. Much like stocks on the market, the customer perception of value is not fixed and price will need to change accordingly. Pricing that truly captures value is pricing that will need to be regularly reviewed. If you want to discuss any of the practical elements of implementing value based pricing in your small business, please feel free to contact Continuous Business Planning today. I'm confident that there is money literally being left on the table in your interaction with customers that we can help claim for you today.